SOMEONE IS CONFUSED & I AM NOT THAT SOMEONE! In Fraterna vol. 20, #4, Mr. Kloppenburg published a new hoya name. It is Hoya ramosii Kloppenb. et Siar. I may be wrong but I suspect that Siar’s name is appended only as a courtesy and to give the scent of authority to an otherwise sloppy presentation. 1). 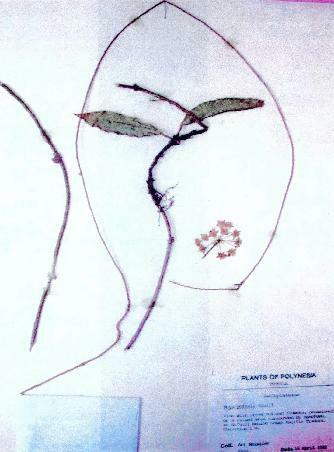 Mr. Kloppenburg cited, as Type, a specimen #75500, which he said was at Philippine National Herbarium (PNH). He did not say whose #75500 this is but I’m sure that it is one collected by Ramos & Edaño. 2). I have in front of me an inventory, made by Kloppenburg, of all the hoya specimens in that herbarium. It doesn’t have a Ramos & Edaño #75500 (which was collected in 1928). In fact it doesn’t have any specimens dating before 1946. All older ones were destroyed by the Japanese when they occupied Manila in WW-2. 3). I have in front of me an inventory, made by Kloppenburg of all the hoya specimens in UC-Berkeley Herbarium. It lists a Ramos & Edaño #75500. It was of material collected in 1928. It bears the label of Hoya intermedia Schltr. There is a duplicate in NY Botanical Garden’s Herbarium. I had the opportunity to examine it and it looked like Hoya kentiana to me. 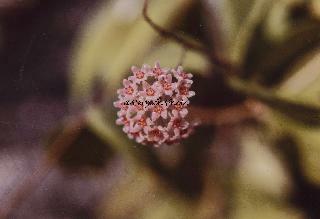 NOTE: I have seen other specimens which were labeled as Hoya intermedia Schlechter. All others I’ve seen appeared to me to be what we now call Hoya heuschkeliana Kloppenb. The name Hoya intermedia Schltr. was never published and would by now be untenable due to a valid publication of the name for a Fijian species by A. C. Smith. If you’ll go back an issue of both Fraterna and PS-TheHoyan you’ll see that Kloppenburg tried to rename Hoya intermedia A. C. Smith and call it Hoya smithii. That publication is not valid because this change isn’t allowed by the Code. Hoya intermedia A. C. Smith is and always will be Hoya intermedia A. C. Smith, unless someone finds a previous publication of the same species and sinks it. That is very likely as Smith did learn that it was a cultivated plant that escaped cultivation. He said that it had not been found in the wild except in that one location. It could have been imported from China, Indonesia, or even from a hobby grower in the US. Now, dear friends, take a look at Kloppenburg’s publication of the name Hoya ramosii in Fraterna 20. #4. Do you see anything that looks at all like these 3 pictures, which Kloppenburg claims are this species? What do I think these pictures are? I believe that #1 and 3 are probably Hoya vitellinoides Bakh. f. and I believe picture #2 is most likely Hoya imbricata or one of it’s varieties. I have never seen that double ridge in the anther wing area on any other hoyas. Mind you, I’m not saying that I am 100% right. I think that my theories should be investigated by someone with younger eyes and an uncluttered brain! I could be wrong but never as wrong as DK is 90% of the time. The difference between us is that I admit being wrong and eat a lot of crow when I’m proved to be wrong. DK simply remains quiet, no matter how wrong he is proved to be. That seems to be interpreted by most hoya fanciers as “taking the high road!” Needless to say, I have another name for it! In Fraterna vol. 21, #4, Kloppenburg published a new name for an old hoya species, Hoya pycnophylla Rech. He called it, Hoya nuuuliensis. Left: DK’s type specimen for the new name he gave to a previously published hoya species. He calls it Hoya nuuuliensis. Right: A photocopy of the previously published hoya, which is Hoya pycnophylla Rechinger. 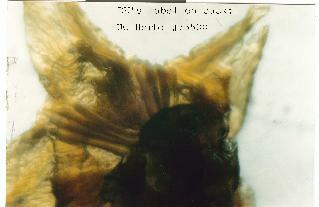 This is a photocopy of Rechinger’s holotype specimen (his own collection #468). This copy is on a very slightly smaller scale than the one on the left. It was published by Rechinger in an article, Botanisch-zoologische Ergebnisse von den Samoainsein om DENKSCHRIFTEN D. KAIS. ADAD.. D. WISS. MATH. NATUTW. KLASSE (1910). 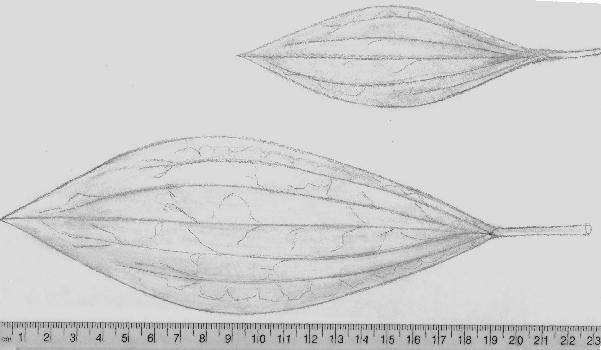 The only differences between these two is that Rechinger described the leaf veins as quintuplinervis and conspicuous. A close examination of his type shows that some leaves appear quintuplinervis but most appear triplinerved. Any other differences in the two author’s description can be chalked up to two different author’s interpretation of word meanings. I believe that anyone but Kloppenburg will recognize Kloppenburg’s plant as Hoya pycnophylla Rechinger. Question: I’m confused. I have seen numerous pictures of hoyas that are labeled Hoya camphorifolia. All of them look like different species to me. Mr. Green sold it to my friend as Hoya fischeriana. She gave me a cutting of it. We’d both like to know the correct name for this species. Please, help! Which hoya is Hoya camphorifolia and which is Hoya fischeriana?” ----- Judy Simons, Miami. Answer: Since most of Warburg’s holotype specimens were destroyed when Allied bombs fell on Vienna during WW-2, absolute proof of which hoya is which cannot be established, in some cases. He may have made duplicates of some of them but the late Hon. Douglas H. Kent searched high and low for isotypes and found none of this species. 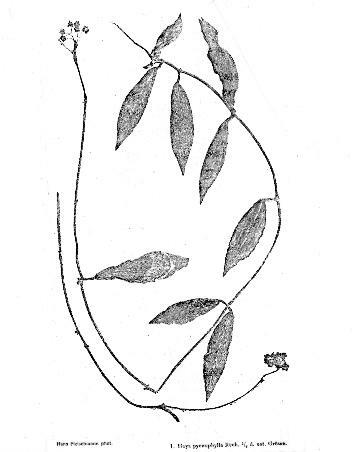 Above: Hoya camphorifolia leaf outlines drawn from description given by Warburg in his original publication. They match, exactly, leaves on McGregor’s 334 and Ramos & Edaño’s 29092. Some of the McGregor leaves were twice longer but the same width. Above: Hoya fischeriana Warb. 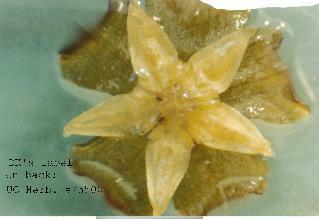 The two leaves shown are based entirely on Warburg’s Hoya fischeriana name publication. I found several non-type specimens at US which look exactly as this one. The one with flowers appears to not be this species. 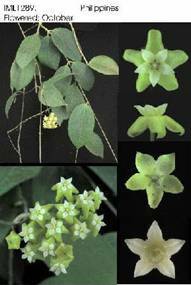 One that I examined matched Warburg’s description of Hoya quinquenervia and the other matched Hoya merrillii. IML-1289 was listed in David Liddle’s 2009 catalog, as Hoya fischeriana. I haven’t seen it in bloom yet but I made two complete sets of microscopic pictures of its flower parts, using flowers furnished by David Liddle and Michael Miyashiro. These flowers fit Warburg’s description quite well, but the foliage doesn’t. Those of the one I (and most others) call Hoya camphorifolia (pictured above), don’t fit at all. I found two others pictured on Web pages, one on a site with French annotation and the other with English. The former has pink reflexed flowers with white coronas, tipped pink in the center. The latter has yellow rotate to slightly campanulate flowers with white coronas, tipped pink in the center. Left: This is David and Iris Liddle’s IML-1289, which was listed in their 2009 catalog as Hoya fischeriana Warb. Its flowers match Warburg’s flower description quite well. It’s leaves do not match at all well. When David gave me that picture, he gave me permission to use it as I see fit. The differences I see between this and Warburg’s description could very well be due to the immaturity of my plant. Maybe, in time, it will grow to be as large as Warburg described. Right: These are two different species that I found in other people’s catalogs, labeled as Hoya fischeriana. Add to that Hoya camphorifolia, which Ted Green persists in calling Hoya fischeriana, and you know just how confused the entire hoya community is concerning which hoya is Hoya fischeriana. My conclusion is that we do not yet know exactly which (if any) hoya in circulation today is Hoya fischeriana and we probably never will know until “the Second Coming!” It certainly is NOT the one Mr. Green is currently selling mislabeled as Hoya fischeriana. His doesn’t match in either flower or leaves. I saw this species pictured in an on line hoya seller’s catalog a day or two ago. It was mislabeled, Hoya vanuatuensis. I suspect that the lady, who is a new comer to the hoya scene may have read Mr. Green’s catalog and read his statement about having previously thought that one of his hoyas was Hoya diptera but on learning that it wasn’t, he published it as Hoya vanuatuensis. Friends, it was a different species that Mr. Green used to sell mislabeled as Hoya diptera. That one is similar but not nearly as colourful as this one. It’s foliage is quite different too. 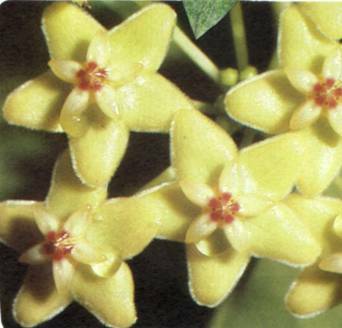 Hoya vanuatuensis is the same one Mr. Green used to sell, mislabeled as Hoya chlorantha. I ordered it from him and was very upset when I got it. I wrote to him that he’d sent the wrong plant. 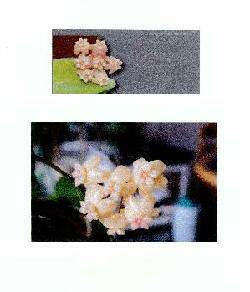 I enclose a picture and description of the Hoya chlorantha type specimen as proof. Mr. Green wrote back and said, “Yes, I caught that too but I had to call it something!” It’s one thing to make and honest mistake but something entirely different to make a mistake on purpose, i.e., just to have something to call it! I know people who still think this one is Hoya chlorantha, thanks to this learned gentleman! NEXT ISSUE: Due to many requests, I’ll begin reviewing the catalogs of hoya sellers and pointing out what I believe to be their errors in labeling.